@Elfin: I do believe it was a little foggy the other day. I flew out on the 19th without any delay. No idea what the weather will be like on the 23rd, but if it is foggy, a delay is likely. Not sure what you mean by "staying overnight situation", it's easy enough to cab/bus between the airport and the city. If flights have been canceled or delayed I'm guessing the tiny 'hotel' in the airport will be full. It's a ripoff anyway, you're better staying at a hotel in the city. Two friends and their infant were flying in from eastern China last night. Ten minutes before arriving at Changshui they were rerouted to Guiyang, where they spent the night. Now my friends say there is fighting at the Guiyang airport and they were hurried onto a plane that shows no signs of moving. I'm flying out of Changshui tomorrow, I half-expect to run into them then. Kunming has a shame, and its name is Changshui. 'A journalist from the Kunming-based newspaper Yunnan Daily, who declined to be named, confirmed to the Global Times that the airport, which went into operation just six months ago, was short of ground crew and not equipped with enough support facilities. I didn't see anything resembling a heating system in the airport. Even if there is one, one would think it might be nice to have it operational by January. Turns out that my flight that I gave up on last night was canceled, and I was refunded my money without having to get a flight cancellation certificate like two days ago, which involved fighting my way to the counter and vying for the attention of the overwhelmed staff. A friend of mine went to the airport today and her flight left on time at two, so I decided, just for a laugh, to try for the third day in a row to fly out of Kunming. Heinz's comment above suggests that the chaos from less than a day of fog two days ago may still be an issue. It seems that there is very little in the way of contingency planning at Changshui International Airport for emergencies or even normal occurrences such as cold weather. 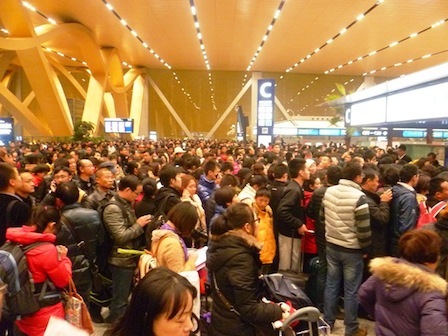 I truly hope the loss of face for the airport and Yunnan Airport Group spurs someone in charge to make sure that the airport is more prepared for emergencies and other mafan in the future... if something like this happens during Chinese New Year it may take ages to get things back to normal.